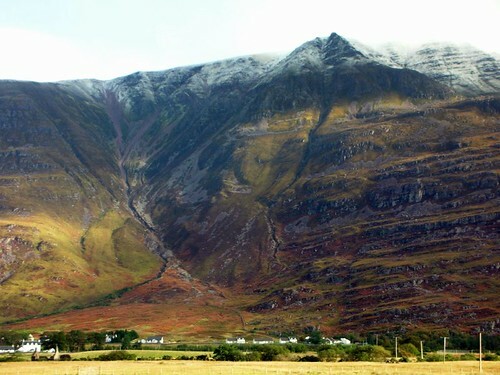 I awoke to see a smattering of snow on the hills above Torridon, winter was approaching and although it didnt feel cold the night before, I knew that the temperatures would soon be dropping. According to the forecasts, we should expect a colder winter this year. I have no problems with that – I’m fed up with the run of mild wet winters we have had the last few years. I want to see snow again, lots of it – instead of thiose wishy-washy excuses for winters that we have been having. The walk around the south side of Loch Torridon afforded stunning views of Ben Alligin and Liatach, the Munros to the north of Loch Torridon. After a while I reached the little highland village of Sheildaig and dropped into the local pub for a coffee. Sheildaig is a lovely little village, with its ornate lamposts and it had an air of a village that was well kept and a thriving community. As I go around Scotland I ask myself whether I could imagine living in the various places I pass through. Some places look run down with a whiff of dejection about them, whereas others look as if they are thriving. 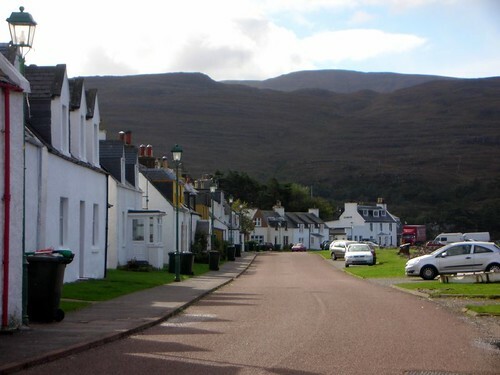 Sheildaig was one of those places I really liked the look of – Gairloch was another place Ive always bee fond of. However perhaps living there would be different in actuality. Then I just remind myself that there will always be more attractive places coming up on my travels and perhaps the best course of action for me would be to continue being a nomad for the rest of my days. I’m spending most of my days in the campervan and apart from always being on the look out for a place where I can fill up with water and somewhere that feels safe to park it for the night, I am usually perfectly happy. Maybe that will change when I get too old to get around but it suits me at the moment. This entry was posted on Wednesday, September 26th, 2007 at 11:03 pm and is filed under Scotland, trail, Travel, trek, walk. You can follow any responses to this entry through the RSS 2.0 feed. You can leave a response, or trackback from your own site.